Whether you want a new front door fitted or just a lock repaired or replaced, regardless of type of door (UPVC or wooden), we can help with your door and lock fitting and repairs, and we will be happy to receive a call from you. Have you locked yourself out, broken your key in the lock, or simply lost your keys, then give us a call? We replace and repair all types of doors and locks, we can deal with traditional wooden doors and replace Yale and Mortice locks, or more modern UPVC doors and locks. 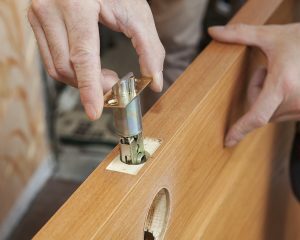 A lot of the calls that we receive at A C Joinery are about sticking doors, stiff locks, loose hinges, or the door lock tongue is simply catching on the latch plate. These type of repairs and maintenance can often be done within the hour. As well as repairing faulty locks we can also supply and fit new doors, whether they are UPVC or wooden. We can replace like-for-like, or if the door is old it can often be rotten and beyond repair – in these cases we can help you choose a new modern door. Along with our window replacement service we can also replace old doors or repair them. In some instances we can replace French windows with new UPVC ones. The service that we provide will include carrying out a survey, measuring and quoting for work required. As well as doing smaller jobs like repairing faulty locks we are often asked to attend to all the door and lock fitting and repairs in a house, including the internal doors and fitting new modern ones will give the property a real face-lift. This upgrading/updating work sometimes involves providing a larger opening to a room ie. changing from a single door entrance to a double door entrance. Such work would also involve some plastering and decorating work and we can complete all this ancillary work. When considering replacing external doors often the most important issue to address is the cost. However, when replacing or updating external doors priority should be given deciding whether the doors should be of wooden construction or UPVC, and secondly what type of security locks will be needed. So irrespective of what your door and lock requirements are, our door and lock fittings and repairs service will provide excellent value for money. Give a call for free advice and suggestions. We are based in Hale and can deal with requests in the South Manchester, Cheshire regions, including Altrincham, Hale, Timperley areas.